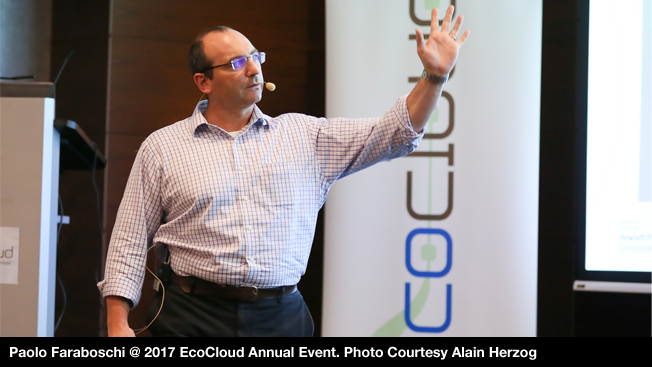 This year’s event will feature industrial speakers and presentations by EcoCloud researchers. Session I (June 18) will focus on Security, Privacy & Trust (Chair: Bryan Ford), Session II (June 19, morning) will include deliberations on Systems (Chair: Babak Falsafi), and Session III (June 19, afternoon) will be themed around Analytics (Chair: Martin Jaggi). In his keynote address, Úlfar Erlingsson (Senior Staff Research Scientist in the Google Brain team) will introduce Google’s work on addressing privacy problems in systems and deep neural networks as well as the RAPPOR and Prochlo mechanisms for learning statistics in the Chromium and Fuschia open-source projects. He will also present techniques for training deep neural networks with strong privacy guarantees. In the industrial session that will follow, leading speakers from the IT industry will share their expertise. Simon Knowles of Graphcore will speak on designing processors for intelligence; cryptography expert Nick Sullivan of Cloudflare will share his findings about evolving web architecture and its impact on security, privacy, and latency; and Hong Wang of Intel Labs will address the question of reinvigorating foundational uArch research to boost IPC. Interspersed with the astute observations of the industrial experts will be presentations by EcoCloud researchers on a range of topics such as distributed clinical and genomic data, distributed ledger technologies, using a central server to protect keys, durability for non-volatile memory, verified NAT, taming skew in large-scale analytics, the revelations of a “click,” machine learning, and taxonomy induction. This is the seventh edition of the EcoCloud Annual Event. Like past years, the outcome of the interactions among researchers and industry stalwarts is bound to have a major bearing on future innovations in the cloud computing industry.